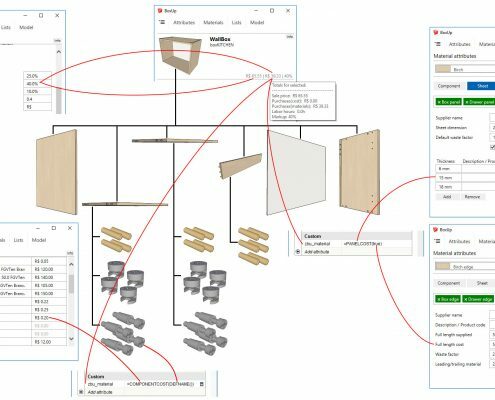 Useful when working with sheet based furniture and structures based on profiles. Making Dynamic components easier to work with. Making components behave depending on where a component is placed in another component. BOXLOOKUP will look for an attribute name through multiple parent components, and return the value of the attribute. Can be set to return the FIRST or the LAST value found. Returns the value of the attribute found. Error is raised if no attribute is found. This will return the value of the first found attribute called ‘bx’, which could be a cabinet depth. BOXSWAPCOMPONENT function is placed on the component that can be swapped for another component on a custom attribute, that could be named ‘select_door’. Selector attribute must be a LIST choice and can be placed on the component itself or on any parent component, the FIRST attribute found will be used. Option list on the selector attribute will be automatic populated every-time the component is redrawn. Option list is populated with component files that has matching tags. The Tag system for components are used to find options. New component are inserted and the old removed. If ‘Allow automatic purge’ is set in ‘Extension preferences’ the removed component is purged from the model. Name of the selector attribute. Name must be in quotations. If the second parameter id TRUE, formula for ‘x’ ‘y’ and ‘z’ position will be copied to the new component(s). This is useful if one selector swaps multiple components. FALSE is default. Returns text ‘Swap done’ or ‘Options updated’ if successful. Error is raised if selector attribute is not found. This will swap the component that hold the formula, with the file selected in ‘door_selector’. State must 0-3. 0 = no user access, 1 = user can view, 2 = user can edit textbox, 3 = user can choose from list. State is required. Cost will be calculated based on the attributes found on ‘Material attributes’ for Sheet cost and waste factor. Square area is calculated by multiplying the two longest of LenX, LenY or LenZ. If any none ‘Primary face’ has a Linear material, cost will be calculated based on attributes found on ‘Material attributes’ for the Linear material, waste factor and leading/trailing material. Length of Linear material will be the longest of LenX, LenY or LenZ. TRUE will include calculated cost of secondary Linear material if any found. FALSE will calculate only Sheet material. FALSE is default. Error is raised if no material attributes is found or if area is 0. This will return the calculated cost of a component with sheet material on primary face. Cost will be calculated based on attributes found on ‘Material attributes’ for the Linear material, waste factor and leading/trailing material. Error is raised if no material attributes is found or if length is 0. This will return calculated cost of a component with linear material on primary face. This formula could find the cost of a drawer slide, where the key contains the definition name i.e. ‘Drawer slide telescopic’ and lookup a cabinet’s drawer depth i.e. ‘500’, resulting in a key ‘Drawer slide telescopic 500’. BOXDEFNAME will return the component name as found in the Sketchup Entity Info under Definition. The name can be stripped of any trailing characters after #. TRUE will return Definition name as found. FALSE will remove any characters found after a ‘#’ including the ‘#’ itself. Error is raised if no name was found. This will return definition name of the component, stripped of any numbering (i.e #2). 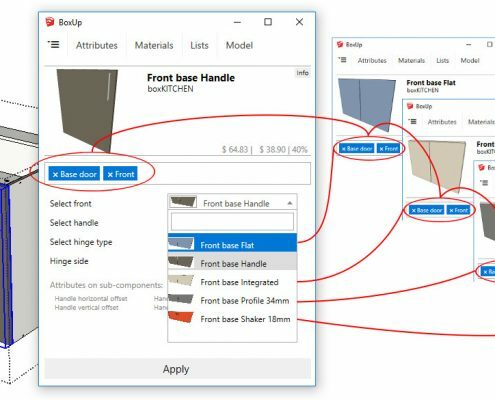 BOXDCNAME will return the component name as found in the Sketchup Dynamic Component Editor. Not to be mistaken for the name attribute. No parameteres is alowed, but () is still required. This will return the name found in the name attribute of the DC component. Error is raised if name attribute is not yet given. BOXPRIMARYMAT will return the name of the material found on the ‘Primary face’ of the component. Error is raised if no material was found. This will return the name of the material found on the components primary face. BOXSECTIONS will define sections within the component along z y or z axis. Use other section functions to enquire section information. Section list is defined by sets of start position and length within the component, separated by commas. Other DC function used to calculate these sets of position and length. Sets start position and length, as many as needed, all separated by commas. Returns a formated list for easy reading. Error is raised if the list has an odd number of entries. BOXSECTIONNEAR returns the nearest start position i the given sectionlist along the given axis, from the point where a component is newly inserted. This will return the nearest start position in section list “section_x” along “x” axis. This will return the position number of where it is currently placed in section list “section_x” along “x” axis. BOXSECTIONLEN returns the length of the section where the component was inserted into another component. This will return the section length of where it is currently placed in section list “section_x” along “x” axis. BOXSECTIONINDEX returns the section number(index) of the section where the component was inserted into another component. Returns 1 for first section, 2 for second section and so on. This will return the index number of where it is currently placed in section list “section_x” along “x” axis.